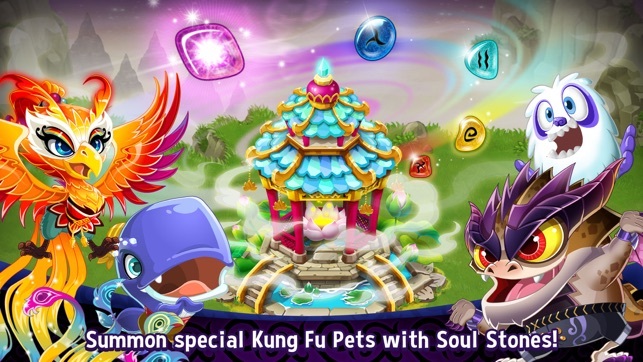 Discover the mystical new world of Kung Fu Pets! 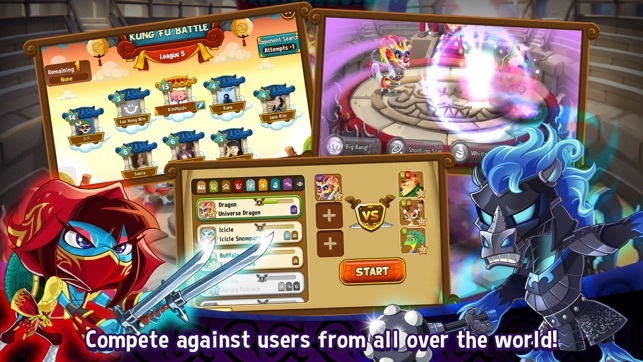 Train your pets to become the ultimate Kung Fu masters and battle against your friends! Welcome to Xiaolin Village, where the inhabitants practice Kung Fu day and night to become legendary Kung Fu Masters! 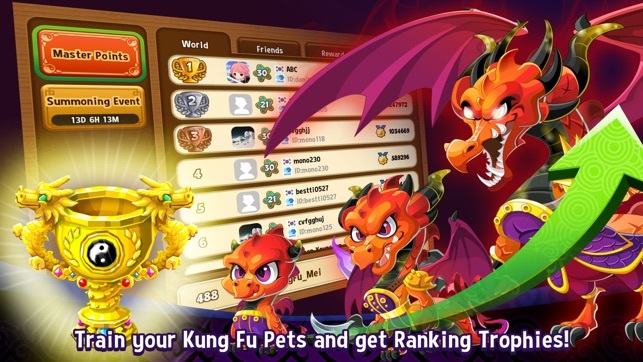 Summon new Kung Fu Pets through unique combinations and fight battles against friends to dominate the Kung Fu Tournament! 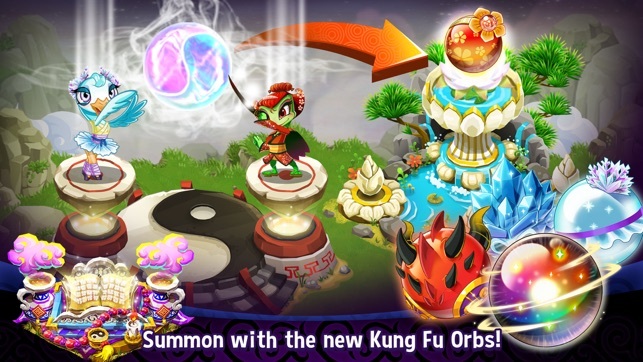 Fight against the evil forces to bring peace and harmony back to Xiaolin in Kung Fu Pets! 1. 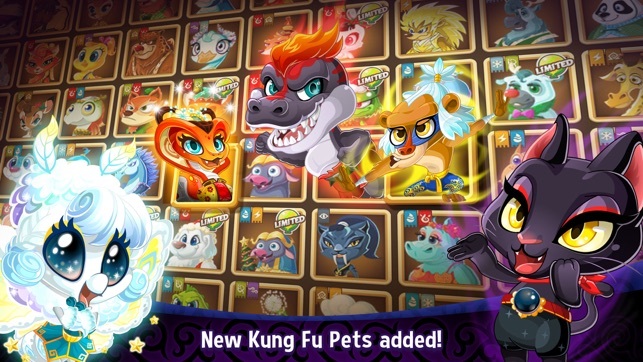 COLLECT unique Kung Fu Pets through tons of combinations! Complete the Hall of Fame by collecting all of the Kung Fu Pets and get extra rewards! 2. RAISE your Kung Fu Pets from adorable babies into Kung Fu masters! Train and feed your Kung Fu Pets with gourmet meals to help them evolve through 3 stages! Level up your Pets so they can unlock new skills and dominate the Kung Fu Arena! 3. 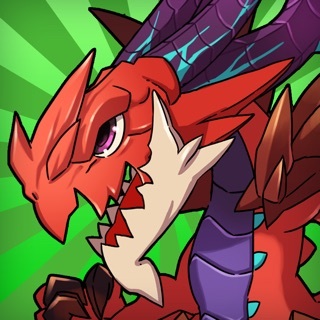 FIGHT in strategic battles according to element types and strengths! Create habitats and special training areas so your Kung Fu Pets feel at home! • iOS 8.0 and up is required starting with v1.3.8. 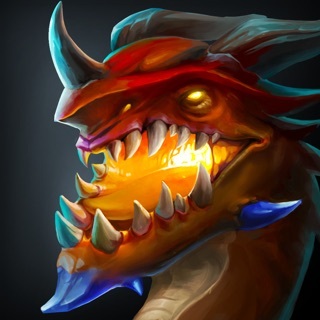 OMG this game is AWESOME! I just got the air eagle. I love the challenges with he habitats and money. I think it’s perfectly fine without guilds or global chat. It stands out a lot compared to your other games, which is good. I love the combinations, and many may say it’s like dragon vale, but I don’t like that game. It’s too overwhelming. It’s fun to play this game more, because it isn’t overwhelming. I’m addicted to it. I need to get a habitat for 500,000 coins, and I am earning badges to get the coins. It’s fun to summon and figure out how to get certain animals. If anyone is debating for this game, get it, because it is TOTALLY worth it. I haven’t gotten any crashes or bugs or anything like that. Ok so it is a fun game but while I was collecting money from the habitats I got the quest completion for the week ok so I collected it and you know what happened let me tell you what happened it kept going on for 2 minutes but that was ok I got money that was ok but when I closed that and started to finish collecting From all my habitats I looked at the top right corner before collecting it I noticed it was all zero nothing was there all my money all my gems all my food gone nothing please help me with this. This is a very fun and interesting game but I don't know how to move the habitats or anything else! I used to have no problem with this but now i dont know how without putting it in storage and i cant just get rid of my animals! If there is something i am missing please let me know! Thank you for reading my review, i hope this problem is fixed or i can find a different way to move things.